TeQuana Colvin at Flawless Face Makeup Artistry photoshoot. Flawless Face Makeup Artistry has serviced hundreds of clients for a variety of occasions, including weddings, theatrical productions, adult and child parties and more. Many customers receive a makeup application, but Colvin’s business is differentiated by the opportunity it provides its customers to receive customized personal and event-oriented makeup lessons. Flawless Face Makeup Artistry has quickly become one of the most sought after makeup services in Cincinnati, Ohio. Colvin has been featured on local radio and television stations including Fox 19 and WGRI 1050. Flawless Face Makeup Artistry was also featured on Cincychic.com, an online publication for women in the Cincinnati Area. During the summer of 2014, Colvin was obliged to service VH1’s ‘Love & Hip Hop Atlanta’ reality TV star, Mimi Faust for her appearance in Cincinnati, OH. Colvin’s work has been featured in Dark Beauty Magazine, Elegant Magazine, Kingdom Women Magazine and many more publications. In 2015 and 2016, Colvin worked as a makeup artist in New York Fashion Week and participated in the International Makeup Artist Tradeshow (IMATs) in New York. TeQuana Colvin applying makeup to model. Flawless Face Makeup Artistry is a freelance makeup company that provides professionally applied cosmetics. Services available include natural makeup, evening makeup, bridal makeup, theatrical makeup, special FX makeup, styling, photoshoot concept creation, henna, bodypainting and more. Makeup services can be contracted for individuals or groups and are tailored to each client’s specific requests. TeQuana Colvin is the founder and single artist of Flawless Face Makeup Artistry. Flawless face launched after TeQuana Colvin held a successful, highly requested makeup application workshop titled ‘Flawless Face Affair’ in August of 2013. That event had such a wonderful turn out that Colvin decided to expand the concept into an actual business. 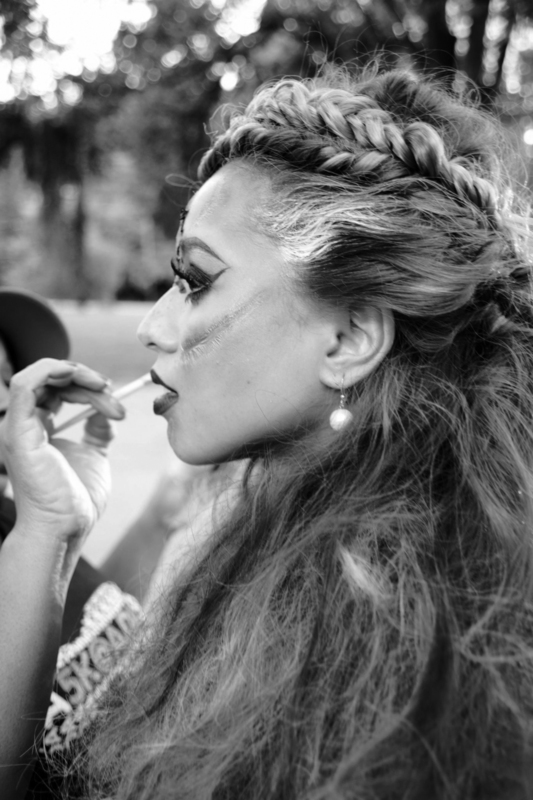 TeQuana Colvin creatively directing at 2014 Halloween photoshoot. Furthermore, Colvin’s goals are to become a household name and for Flawless Face Makeup Artistry to continue to acquire national and high-profile makeup opportunities. Colvin hopes to eventually manufacture and distribute a makeup product under her own brand’s name. Flawless Face Makeup Artistry believes that “To be fierce is to be flawless.” For additional information and for booking, please call (513) 213-2309 or visit https://www.facebook.com/flawlessfacemakeupartistry.